There are many promises in the Bible. But they don't come as entitlements. God is Holy and we are in possession of a sinful nature and He does not owe us a single thing. I sat down today to write about how God hears our prayers. I have watched Him answer prayers time and again. And sometimes He doesn't. Why wouldn't a loving God answer our prayers? Sometimes the answer is no. Sometimes what we would rather prevent is the very thing that can bring Him the most glory. Jesus, who was without sin (I'll tell you why I point this out in a moment), had at least one request that God said no, there is no other way. Jesus. On His face. On the even of His crucifixion begging God to find another way. God told His Son, His perfect, sinless, loving, giving, Son "No." Because there was no other way. Sometimes God hears. And His answer is no. Other times, the answer is wait. We don't like to wait. Ask anyone under the age of four or five to wait and see what our human nature does. NOW. Crying and wailing and thrashing. "It's my money and I want it NOW!" Mom I see that you are currently cleaning my cup to get me some nice fresh milk in a nice clean cup but I want to be drinking that milk right now. I don't care that the cup I want to drink it from is all soapy. But just one verse before, the prophet tells Israel they will be exiled for 70 years as a consequence of their disobedience. Sometimes wait just means the time isn't here yet for that prayer to be answered. Israel prayed for centuries for their Messiah and God sent Him when the time was just right. Then, the thing I don't want to tell you. The thing I did not sit down to say today, but deep down knew to be true. But I know some of you will NOT like the sound of it. Please understand that God is Holy. His is Good and Loving and Gracious ... but above all He is HOLY. He cannot have a relationship with sin. Sometimes, God DOES NOT hear us because we are entertaining sin. Yes. 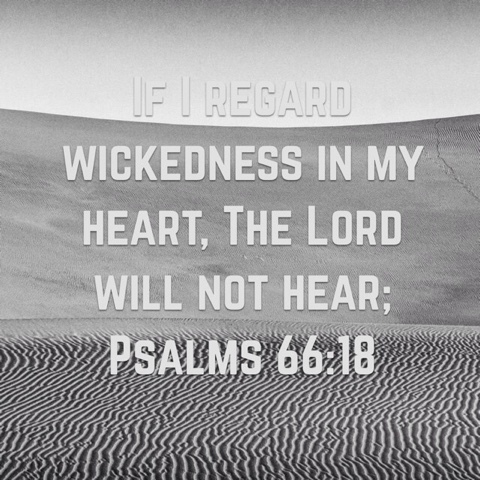 God will not listen to you when you are willfully living in sin with no plans to stop. He knows your heart. If you seek Him without humility. If you choose out of stubborn selfishness not to obey, then don't expect God to hear. He doesn't owe it to you to listen. Quite the contrary, we owe everything to Him and we owe it to Him (and quite frankly ourselves) to be obedient. And there it is. The promise. If we fear God. If we do His will. Just OBEY, He will HEAR you. I know, I know ... to your average red blooded rebel of an American this does NOT sound appealing. I dare you. TRY it. Don't test God ... but what would it hurt to try to get to know Him? Find out what it means to obey, do it, then try talking to Him. With humility. I can't tell you how many times this has proven true in my life. One example, just one. I had given up on the "the church." The "church" had hurt me. I don't need this kind of negativity in my life! said I; and off I went. Directionless. Selfish. I finally found myself at a loss. Wanting to return to Texas, but facing a future in a cold and lonely place. "Thank you for your interest but we've chosen another candidate." One night I got down on my knees. God I don't know where I'm going, but when I get there I know you want me in fellowship with other believers. I will find a church and I will get involved and I will start reading your Word again. The very next morning. I was still in my big comfy robe. I got an unexpected phone call. The candidate had backed out and I was being offered my dream job back in my home state. You better believe as soon as I got to Austin I found a church. Now I know that I can approach His throne with confidence. I have no doubt that He hears my prayers.